understand the causes of the nation’s number one disease: back pain and other office illnesses. aware of it when we feel pain. especially well in order to protect their health and prevent back and shoulder pain. performance and vitality of the employees. German quality at a sensational price. corrects your posture in every sitting position. The seat surface is tilted forward and up. better supply of vital nutrients to the spinal discs. of pressure. It promotes blood circulation and activates vein flow in the legs. Blood can return to the heart more easily instead of stagnating in the legs. Optimal circulation offers the best protection against thrombosis and cold feet..
lead to feelings of numbness and impotence. Women sit differently because they are biologically and anatomically different. A woman’s pelvis is flatter and wider than a man’s. Women are susceptible to lordosis, which means they need a different kind of support. Women also breathe 4-6 times more per minute than a man and have a greater need for motion in the legs, hips, and rear. Men sit differently because they have more muscles and a different physical composition. Men have a different pelvis shape and are susceptible to humpback. The reproductive organs are on the body’s exterior and by nature are not made for heat. You are a unique individual. 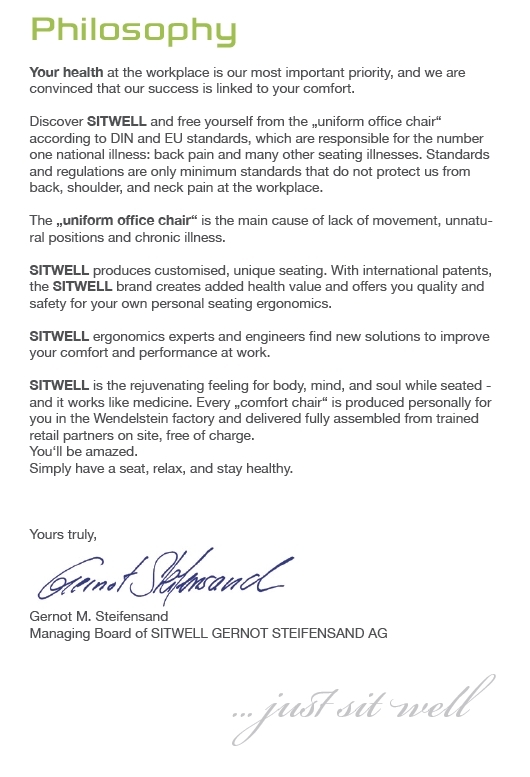 Make a decision for your individual SITWELL Gernot Steifensand custom seating solution for better health at your workplace. SITWELL is ecological, environmentally friendly, and has ahigh level of individuality and recognisability. We offer a special service, long warranty periods, and recycling – a big plus for many of our customers. SITWELL is dedicated to keeping you fit through ecological and biological seating, which reduces down-time and illness costs at the computer station. SITWELL is the brand products were developed over the last ten years with passion and dedication from doctors, occupational therapists, radiologists, sports scientists, seating pioneers, and gender-ergonomics experts as well as with our customers and company doctors. SITWELL distinguishes itself today from competitors with international patents, new materials, and scientifically-tested technologies in order to give our customers the safety and trust to purchase new seating that is comfortable and ergonomic. SITWELL brand quality is made possible with especially high quality „hand-made in Germany“. This long life cycle rouses human emotions and health consciousness. can spare you from many seating illnesses. 5 years of SITWELL brand quality. This is a brand promise of special value „hand made in Germany“. All custom seating solutions carry the GS logo for maximum safety at home and in the office. with 220 workdays per year, healthy, customised seating costs an average of € 0.26 per day. of them in such a way as to re-use it in the materials cycle. Medical opinions and scientifically-confirmed certificates and reviews are available for most seating designs. All orders are delivered free of charge and are fully assembled by your local retailer. help you in finding a local retailer and can advise you on seating. workstations (available upon request at no extra charge). 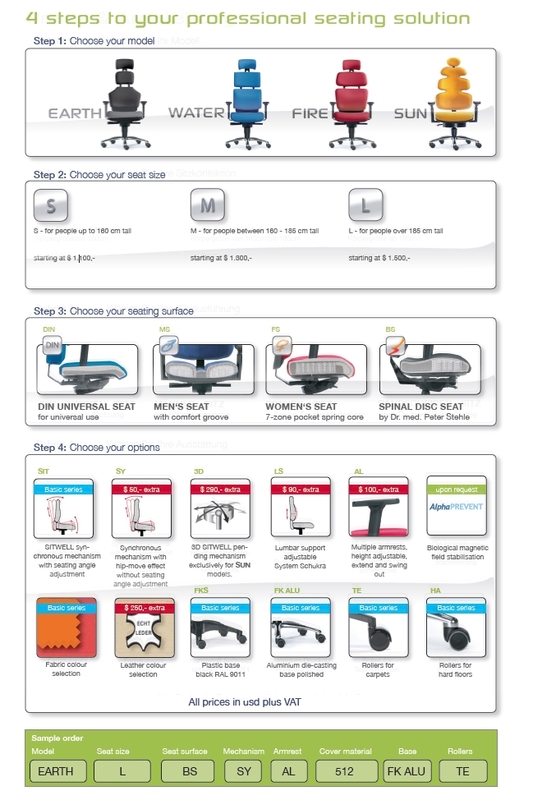 SITWELL Synchronous-Mechanism Basic Series Synchronous mechanism with separate seat angle adjustment. Seat and backrest synchronously follow the movements of the person sitting in the chair with the ergonomically correct positions. Frequent changes of position while seated relaxes the muscles, shifts the burden off spinal discs, and improves circulation. The spinal cord is automatically shifted to the natural S-shapes. All of this ensures fatigue-free sitting. The opposing pressure in the backrest is personally adjustable (50 – 125 kg). SITWELL HIP MOVE Synchronous Mechanism – $50 extra. Synchronous mechanism with automatic hip-move weight adjustment. Seat and backrest follow the movements of the person sitting in the chair with the ergonomically correct positions. The hip-move effect focuses on the pelvis and provides support for the spinal cord. This enables more blood flow to the muscles and promotes nutrient supply to the spinal discs. SITWELL 3-D Pending Mechanism (only for SUN models) – $ 290 extra. This is the best of SITWELL seating technologies when it comes to bio-energetic and 3-dimensional seats. The new and invigorating feeling you get when sitting activates your body, mind and soul, moving you into a series of seating positions. The base portion is separate from the seat surface and swings on 8 cables. Sitting and rocking, just like on a gymnastic ball, releases energy blocks and encourages blood circulation throughout your entire body. Your breathing will improve and you’ll feel bio-energetically fit.